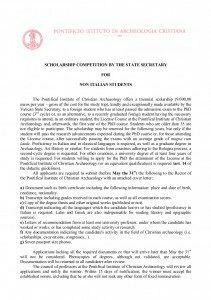 Vatican Scholarship for non-Italian students to pursue masters or doctoral studies in Christian Archaeology at the Pontificio Istituto di Archeologia Cristiana in Rome, Italy. 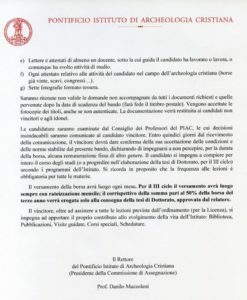 The Pontificio Istituto di Archeologia Cristiana (PIAC) is launching a three-year scholarship for non-Italian students to enroll in its master's or doctoral program in Christian Archaeology. The sponsoring institution, the Vatican Secretary of State, will provide euro 9,000.00 annually for a period of three years, which includes tuition and study tours. 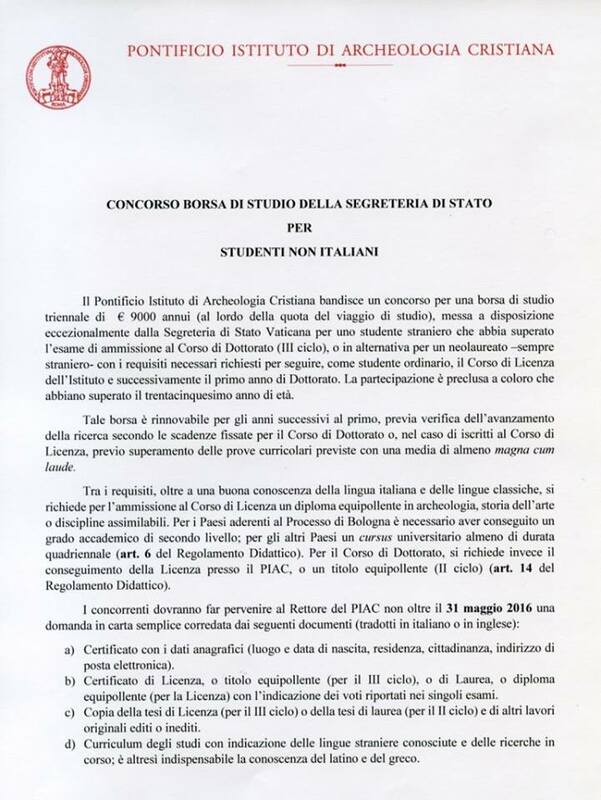 Students who are not Italian citizens may apply for this scholarship to attend either the PIAC's two-year Licentiate (Master's) program, plus the first year of the doctoral program or the three-year doctoral program. More information about these programs is found here. 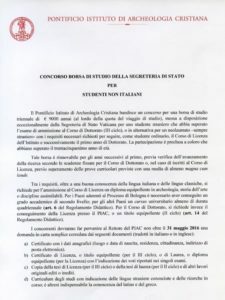 An excellent command of Italian, Greek, and Latin is required, as well as at least four years of university study for admission to the Licentiate degree or the equivalent of a Master's or Licentiate degree in Archaeology or a related discipline for admission to the PIAC's doctoral program. The scholarship competition is also restricted to students under 35 years of age. The deadline to apply for the scholarship is May 31, 2016. Curriculum vitae including research experience and language proficiency. 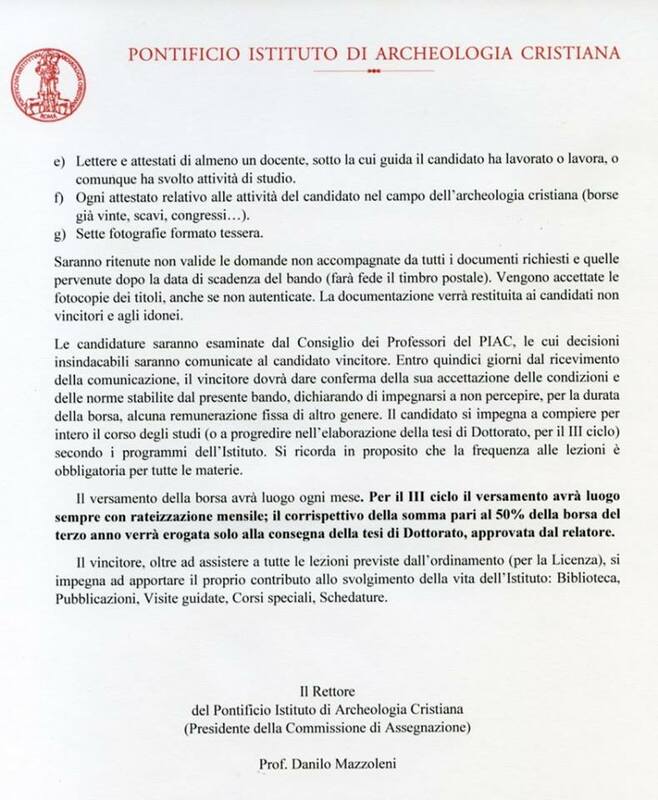 Recommendation letter from at least one professor familiar with the applicant's academic work. 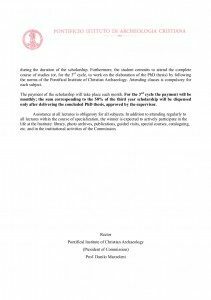 Documentation of any activity in the field of archaeology, including excavations, participation in conferences, awards, publications, etc. All documents must be submitted in Italian or English. Please refer to the PIAC website for all questions or clarifications about the application process.